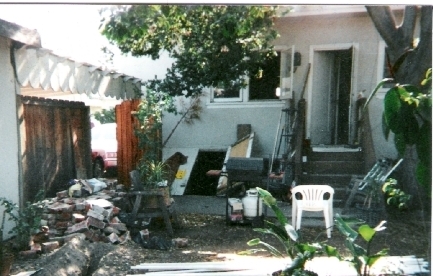 On the left is a view of the back of the house in 1999 when the previous owners lived here. 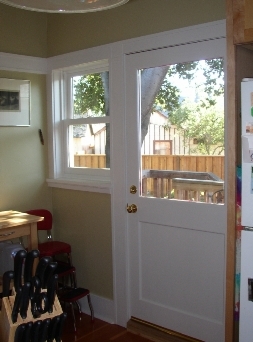 The two windows are on the back wall of the kitchen. 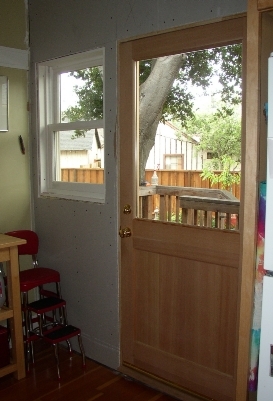 The door goes into a small service porch where there was a corner sink, a toilet, and the washer and dryer. Another door lead inside to the kitchen. The prior owners turned the service porch into a full bath that is accessed from the bedroom that would be to the right in the photo. On the lower edge of the house you can see the basement access with one door open. The photo on the right shows this part of the house soon after when we bought it. The prior owners the two windows in the kitchen with the large French doors. They added a deck, stairs and a covered access to the basement. 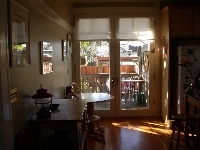 The small window to the right of the French doors is the window in the bathroom they created from the old service porch. 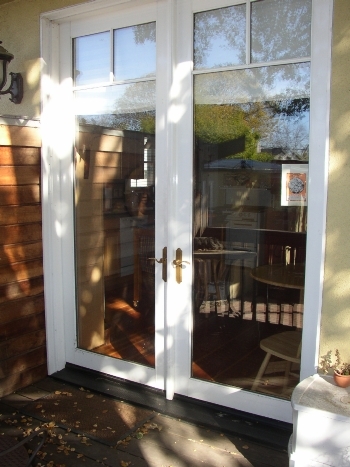 Now for our project - removing the French doors and installing something more in keeping with the style of this house. View from the outside. 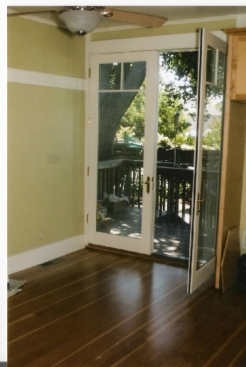 (1) The original 8' tall French doors. 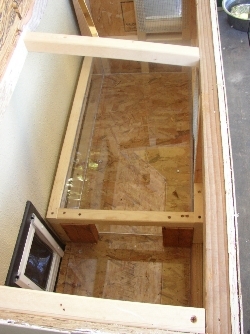 (2) Framed in with plywood. We had a plywood door for four days that we locked with a padlock. 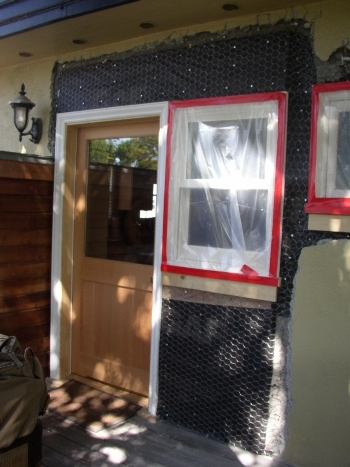 (3) The new door and window are in, and the walls are ready for stucco. (4) Stucco done and the painting has been started. The door and window have just been primed. 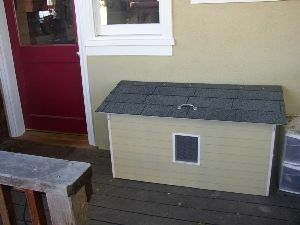 (5) The finished project (minus the outdoor cat box, which you will read about later). View from inside (1) The original doors when we moved in. 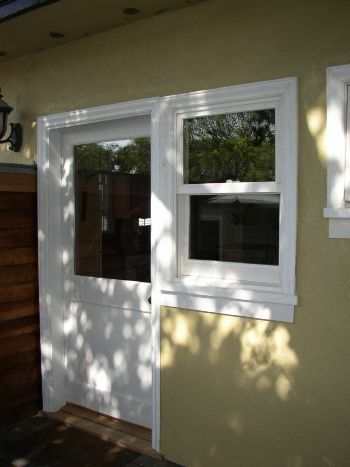 (2) The new door has been installed, but the window has not arrived yet. 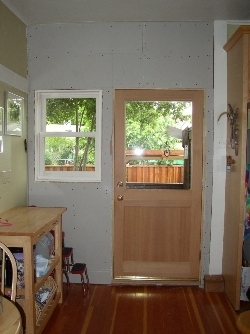 (3) The door and window are in, plus insulation. The outside at this point was ready for stucco. (4) All done but the painting. (5) Everything is painted. The outside of the door is red. Another view inside. (1) The original doors. 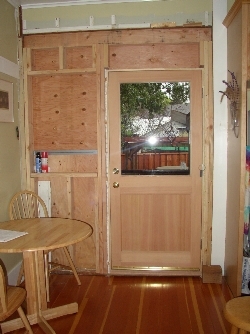 (2) The plywood framing plus the door. 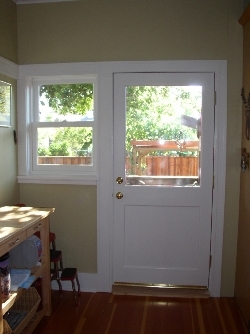 (3) The door and the window are in, but the painting still needs to be done. 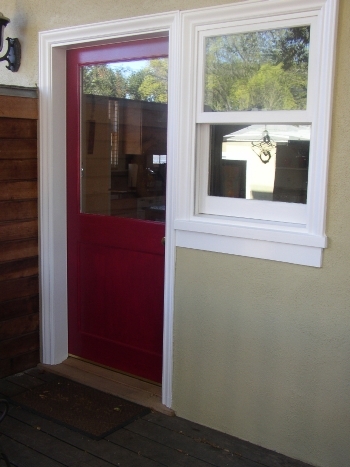 (4) The finished back door and window. Ah, our very cool, new cat box! We have indoor cats and we longed for a way to get the cat box(es) out of the bathroom without turning the cats into indoor-outdoor cats. This was our solution. 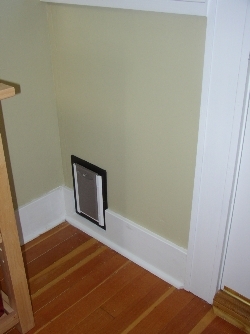 A cat door was cut into the wall under the window in the kitchen. (We will be building a breakfast nook in this location and the bench seat will hide the cat door.) Outside, we have a box that looks a bit like a woodbox, which was our original intent. 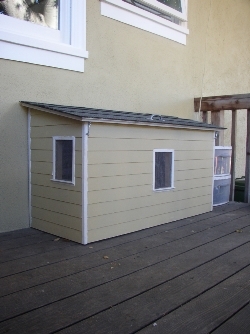 Not too many woodboxes have siding or windows with screens and teensy window sills, however! The windows were just for ventilation, of course, but Paul Davis is such an artist, he had to make the structure beautiful as well as functional. And shingles on the roof! 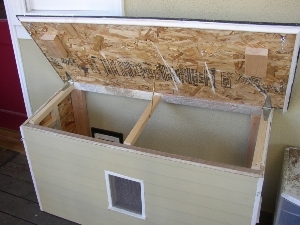 The inside has a small "landing" just inside the door which we hope eliminates some of the cat litter being tracked back into the house, and a plexiglass tray that we filled with cat litter. The roof lifts (see the handle in the second photo?) and locks in place so we can lean in and remove the waste.